Title: 10/01/1987 - Retention requirements for superseded MSDSs. This is in response to your letter of September 1, requesting an interpretation of the Occupational Safety and Health Administration's (OSHA) Hazard Communication Standard. 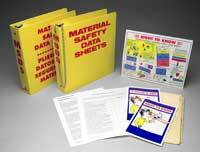 Specifically, your letter addresses the problem of what to do with superseded material safety data sheets. The Hazard Communication Standard requires that employers maintain copies of material safety data sheets for each hazardous chemical used in the workplace. Employers may discard a material safety data sheet for a mixture, if the new data sheet includes the same hazardous chemicals as the original formulation. If the formulation is different then the employer must maintain both data sheets for at least 30 years. OSHA standard, 29 CFR 1910.1020, Access to employee Exposure and Medical Records defines "employee exposure records" to include material safety data sheets. The standard requires all employee exposure records to be maintained for at least 30 years. An alternative to keeping both data sheets, however, is provided for in 29 CFR 1910.1020. Under paragraph (d)(1)(ii)(B) of this standard employers may discard material safety data sheets if some record identifying the substances used, where it was used and when it was used is retained for at least 30 years. Therefore, an employer may discard the original data sheet and retain only the new data sheet if a record on the original formulation is maintained. I hope I have clarified this issue for you. Please feel free to contact us again.